If you’ve been around fashion blogs I’m sure you’ve heard of ThredUp. It’s like an online thrift store with very high standards. I’ve sold and bought a few items so I thought I’d share my experiences. Let’s start with selling. I’ve tried a few consignment shops in my area but they don’t work perfectly for me. One is mostly teen brands which I don’t have too many of. The other is more upscale which I also don’t have a lot of. ThredUp is a good fit for me because my clothes fall in the middle. With traditional consignment stores if they don’t like some of your items you then have to pick them up and dontate them. With ThredUp if they don’t want your items they will dontate them for you. There is also the option to get your clothes back for a fee. When you want to sell you get a polka dot bag shipped to you. Shipping both ways is free. You just fill up the bag and send it back. Processing isn’t speedy. It took about a month for my bag to get processed. They don’t accept a lot items. They only accept about 40% of the items. Most items you get your payout immediately but with designer items you have to wait until they are sold. You can get your payout in cash or store credit. I picked store credit so I could get to the fun part of shopping! 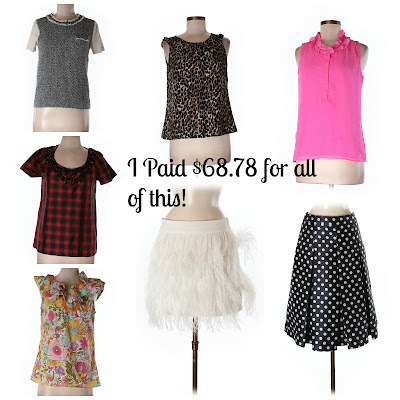 I got these 7 items for $68.78! That is a great deal, less than $10 a piece. I got 3 J.Crew tops. The pink one is a good basic. I think the tweed tee shirt is really unique and the plaid will be awesome for fall. I already had the Loft leopard blouse but it’s getting to small so when I found this one in the next size I had to get it. I love the ruffles on the floral top. The Halogen polka dot skirt was only $6.99. The feather skirt was pricier at $38.99 but still a steal off of regular retail. 6 out of 7 items fit. The feather skirt doesn’t but it isn’t too tight so I’m keeping it for when I tone up a bit. I saved $474 off of retail. I’ve gained a little weight and I think ThredUp is a great way to expand my wardrobe without breaking the bank. Shopping on ThredUp is easy. You are able to search by size which is great so you don’t fall in love with something in the wrong size. The search function is good if you are searching for something general. I had no problem searching for polka dots and sequins. But you will run into trouble if you are getting more specific like roses or feathers. So your best bet is to use the filter. I think the filters are great you can do color, size, brand and sometimes even style. Returns are free if you do them with store credit. I can’t comment on the speed of that I kept all of my items but I do like that returns are free. USE A COUPON: Since this order was my first order I had a 40% off code which saved me $50. They have coupon codes pretty frequently in the emails. I’ve read it is even more frequent in the app. SAVE YOUR SIZE: This is just more of a general tip. I have my size saved so if I’m just browsing I can be confident that something will fit. KEEP LOOKING: The pink blouse I got was on final sale for $19.99 but I also saw it on the site for $23. It’s possible that something you like may be marked down more on the site since items are listed individually. I will keep using ThredUp for my closet cleanups. If you sign up now you’ll get $10 in your account and I’ll get $10 in mine. If you are looking for a fast way to get rid of clothes this isn’t it but I think the convience of just shipping is worth it for me. If you don’t want to sell the clothes are a great deal off of retail price. 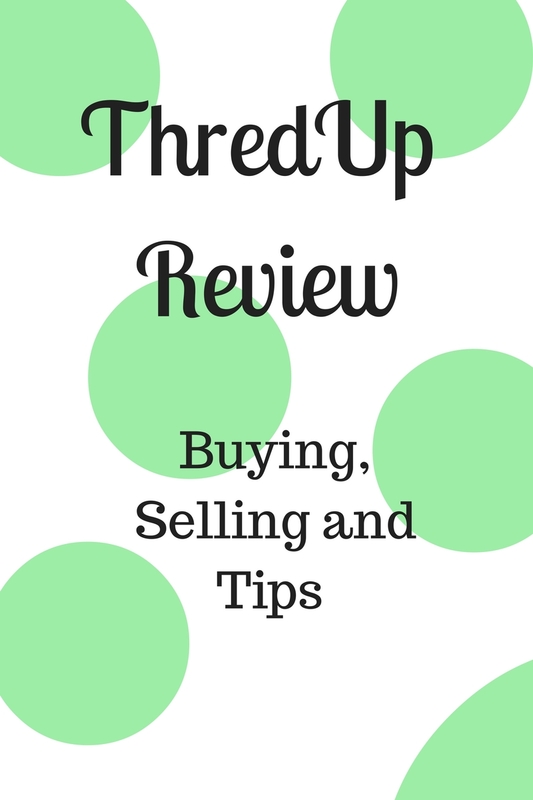 Do you have any other ThredUp tips? Have you used it before? You got such a great deal here, lady! Thanks for the review! I never used Thredup before. I usually I sell my clothes on Poshmark! I love thredup! And I can speak from experience, returns are super easy and you get the credit back a couple days after they receive the item back. I have shopped ThredUP but not sent in clothes. I appreciated your review on how it all worked! I have a resale shop here that I usually use to take things in, but I may need to try this. I love the prices on their things to buy! You got some great items. I have never tried ThreadUp, but I have heard so much about it! I really need to try it some time! Thanks for these tips! I love ThredUp but haven't shopped for a while--thanks for the reminder and tips. I have the app and coupon codes do pop up pretty often, which is fun! You paid such a great price for all of this girl, I am loving the skirt because it looks so fancy! Thred Up is such a fab concept. I'm a fan, too! Sounds like you had a great experience with thredup, and I have been meaning to give them a try for my next closet clean out. it makes so much sense I have such trouble getting things together for the consignment shop. Love the piece you got too!